This is “Net Exports and International Finance”, chapter 15 from the book Macroeconomics Principles (v. 2.0). For details on it (including licensing), click here. It became known as the “Asian Contagion,” and it swept the world as the 20th century came to a close. Japan, crippled by the threat of collapse of many of its banks, seemed stuck in a recessionary gap for most of the decade. Because Japan was a major market for the exports of economies throughout East Asia, the slump in Japan translated into falling exports in neighboring economies. Slowed growth in a host of economies that had grown accustomed to phenomenal growth set the stage for trouble throughout the world. The first crack appeared in Thailand, whose central bank had successfully maintained a stable exchange rate between the baht, Thailand’s currency, and the U.S. dollar. But weakened demand for Thai exports, along with concerns about the stability of Thai banks, put downward pressure on the baht. Thailand’s effort to shore up its currency ultimately failed, and the country’s central bank gave up the effort in July of 1997. The baht’s value dropped nearly 20% in a single day. Holders of other currencies became worried about their stability and began selling. Central banks that, like Thailand’s, had held their currencies stable relative to the dollar, gave up their efforts as well. Malaysia quit propping up the ringgit less than two weeks after the baht’s fall. Indonesia’s central bank gave up trying to hold the rupiah’s dollar value a month later. South Korea let the won fall in November. Currency crises continued to spread in 1998, capped by a spectacular plunge in the Russian ruble. As speculators sold other currencies, they bought dollars, driving the U.S. exchange rate steadily upward. What was behind the currency crises that shook the world? How do changes in a country’s exchange rate affect its economy? How can events such as the fall of the baht and the ringgit spread to other countries? We will explore the answers to these questions by looking again at how changes in a country’s exchange rate can affect its economy—and how changes in one economy can spread to others. We will be engaged in a study of international financeThe field that examines the macroeconomic consequences of the financial flows associated with international trade., the field that examines the macroeconomic consequences of the financial flows associated with international trade. We will begin by reviewing the reasons nations trade. International trade has the potential to increase the availability of goods and services to everyone. We will look at the effects of trade on the welfare of people and then turn to the macroeconomic implications of financing trade. The international market is important not just in terms of the goods and services it provides to a country but also as a market for that country’s goods and services. Because foreign demand for U.S. exports is almost as large as investment and government purchases as a component of aggregate demand, it can be very important in terms of growth. The increase in exports in 2011, for example, accounted for about half of the gain in U.S. real GDP in that year. The conceptual argument for free trade is a compelling one; virtually all economists support policies that reduce barriers to trade. Economists were among the most outspoken advocates for the 1993 ratification of the North American Free Trade Agreement (NAFTA), which virtually eliminated trade restrictions between Mexico, the United States, and Canada, and the 2004 Central American Free Trade Agreement (CAFTA), which did the same for trade between the United States, Central America, and the Dominican Republic. They supported the 2007 free trade agreement with Peru and the 2011 agreements with Colombia, Panama, and South Korea. Most economists have also been strong supporters of worldwide reductions in trade barriers, including the 1994 ratification of the General Agreement on Tariffs and Trade (GATT), a pact slashing tariffs and easing quotas among 117 nations, including the United States, and the Doha round of World Trade Organization negotiations, named after the site of the first meeting in Doha, Qatar, in 2001 and still continuing. In Europe, member nations of the European Union (EU) have virtually eliminated trade barriers among themselves, and 17 EU nations now have a common currency, the euro, and a single central bank, the European Central Bank, established in 1999. Trade barriers have also been slashed among the economies of Latin America and of Southeast Asia. A treaty has been signed that calls for elimination of trade barriers among the developed nations of the Pacific Rim (including the United States and Japan) by 2010 (although this deadline was missed) and among all Pacific rim nations by 2020. Protectionist sentiment always rises during recessions. Unlike what happened during the Great Depression of the 1930s, there was a lot of talk during the Great Recession about more protection, but most countries avoided imposing substantially increased trade restrictions. International trade is important, and its importance is increasing. For example, from 1990 to 2010, world output growth was about 3% per year on average, while world export growth averaged about 6% per year. While international trade was rising around the world, it was playing a more significant role in the United States as well. In 1960, exports represented just 3.5% of real GDP; by 2011, exports accounted for more than 13% of real GDP. 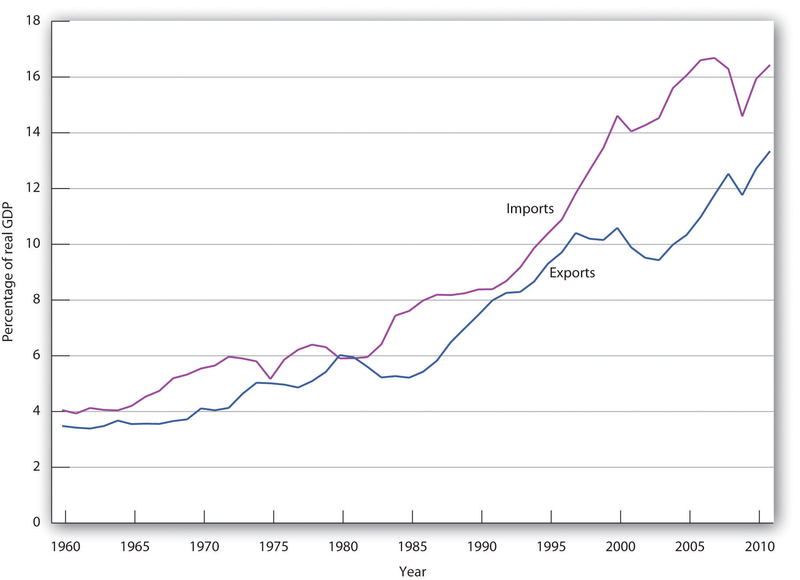 Figure 15.1 "U.S. Exports and Imports Relative to U.S. Real GDP, 1960–2011" shows the growth in exports and imports as a percentage of real GDP in the United States from 1960 to 2011. The chart shows exports and imports as a percentage of real GDP from 1960 through 2011. A nation’s own level of income affects its imports the same way it affects consumption. As consumers have more income, they will buy more goods and services. Because some of those goods and services are produced in other nations, imports will rise. 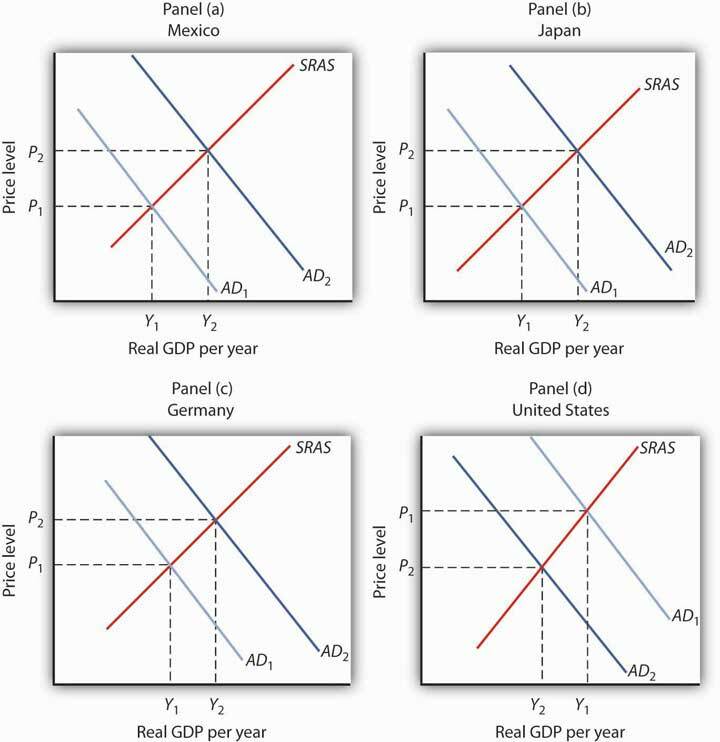 An increase in real GDP thus boosts imports; a reduction in real GDP reduces imports. Figure 15.2 "U.S. Real GDP and Imports, 1960–2011" shows the relationship between real GDP and the real level of import spending in the United States from 1960 through 2011. Notice that the observations lie close to a straight line one could draw through them and resemble a consumption function. 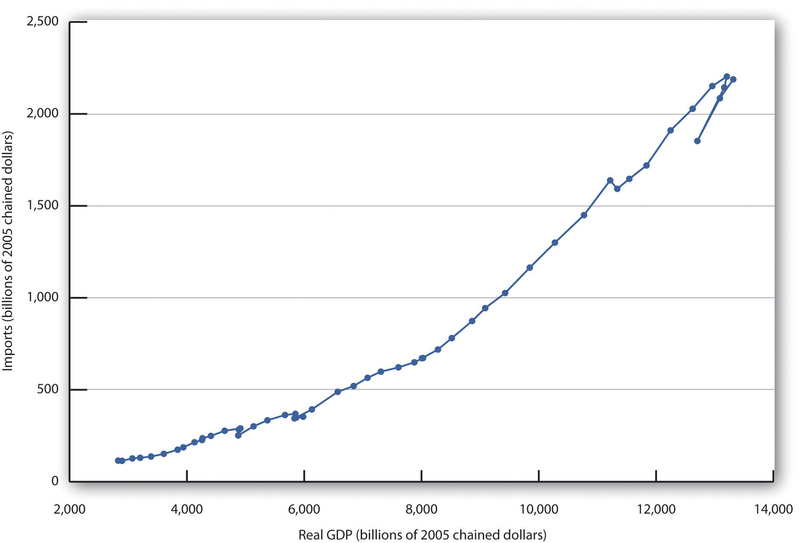 The chart shows annual values of U.S. real imports and real GDP from 1960 through 2011. The observations lie quite close to a straight line. Again suppose that the exchange rate between the dollar and the British pound is fixed at $4 per £1. 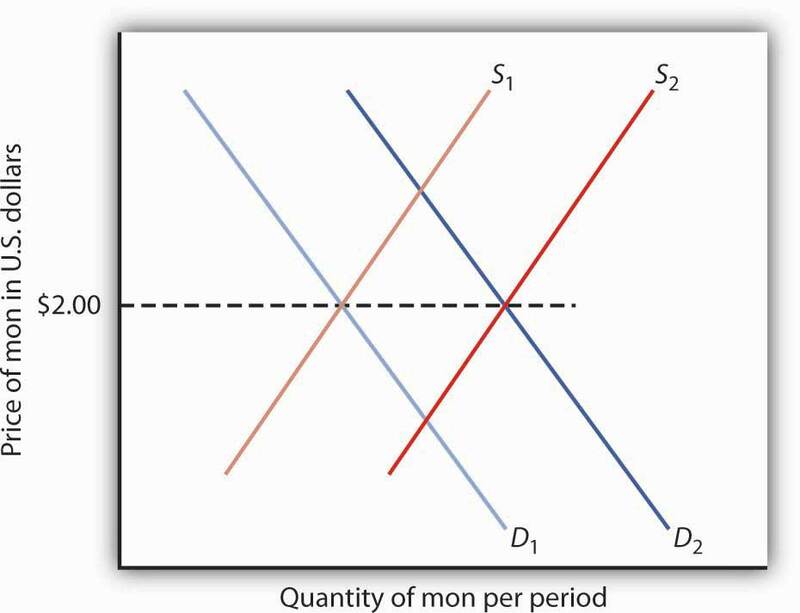 Suppose further that this rate is an equilibrium rate, as illustrated in Figure 15.5 "Maintaining a Fixed Exchange Rate Through Intervention". 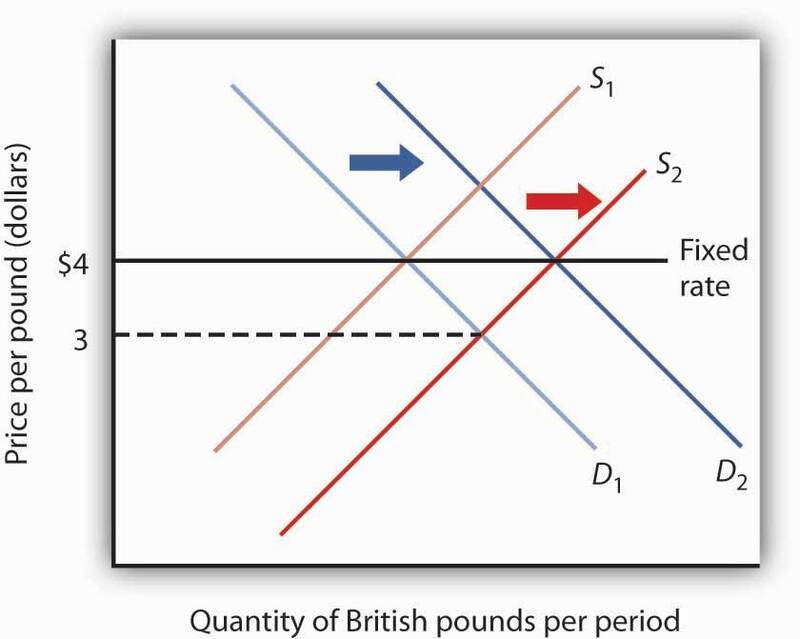 As long as the fixed rate coincides with the equilibrium rate, the fixed exchange rate operates in the same fashion as a free-floating rate. The fact that coordination of monetary and fiscal policies is difficult does not mean it is impossible. Eleven members of the European Union not only agreed to fix their exchange rates to one another, they agreed to adopt a common currency, the euro. 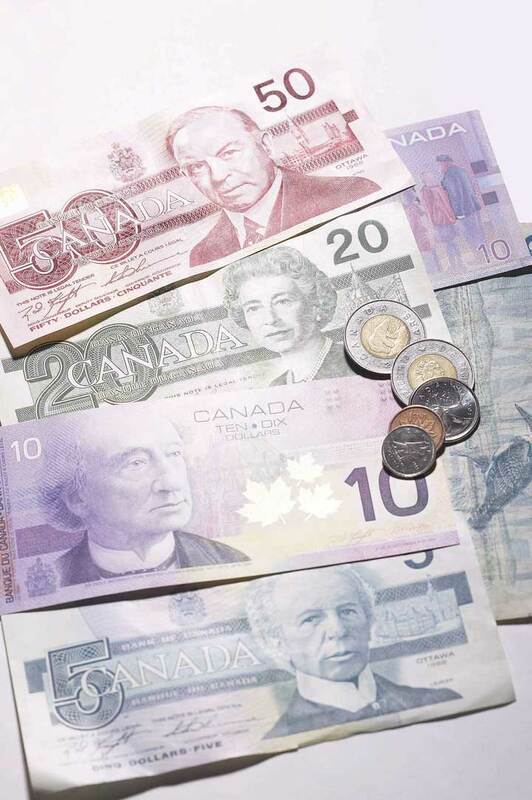 The new currency was introduced in 1998 and became fully adopted in 1999. Since then, six other nations have joined. The nations that adopted it agreed to strict limits on their fiscal policies. Each continues to have its own central bank, but these national central banks operate similarly to the regional banks of the Federal Reserve System in the United States. The new European Central Bank conducts monetary policy throughout the area. Details of this revolutionary venture and the extraordinary problems it has encountered in recent years are provided in the accompanying Case in Point. Thailand’s experience with the baht illustrates the potential difficulty with attempts to maintain a fixed exchange rate. Thailand’s central bank had held the exchange rate between the dollar and the baht steady, at a price for the baht of $0.04. 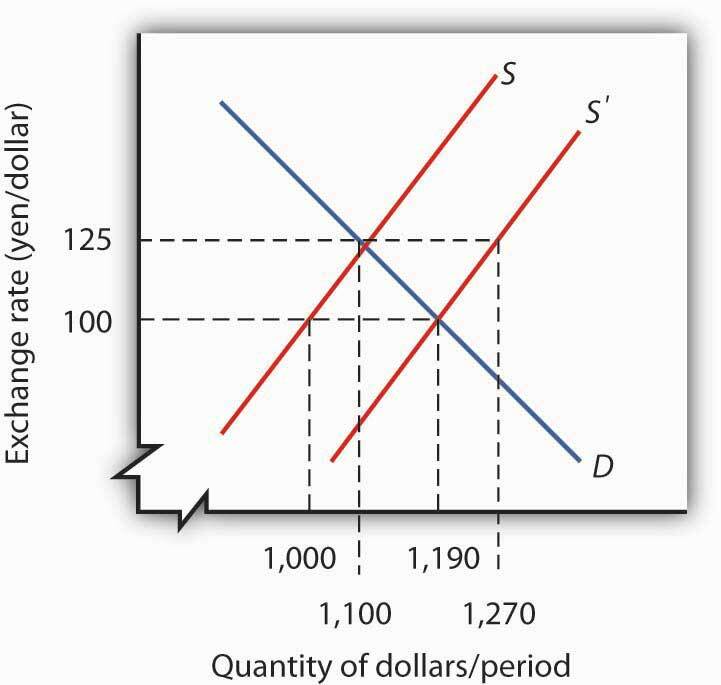 Several factors, including weakness in the Japanese economy, reduced the demand for Thai exports and thus reduced the demand for the baht, as shown in Panel (a) of Figure 15.6 "The Anatomy of a Currency Collapse". Thailand’s central bank, committed to maintaining the price of the baht at $0.04, bought baht to increase the demand, as shown in Panel (b). Central banks buy their own currency using their reserves of foreign currencies. We have seen that when a central bank sells bonds, the money supply falls. When it sells foreign currency, the result is no different. Sales of foreign currency by Thailand’s central bank in order to purchase the baht thus reduced Thailand’s money supply and reduced the bank’s holdings of foreign currencies. As currency traders began to suspect that the bank might give up its effort to hold the baht’s value, they sold baht, shifting the supply curve to the right, as shown in Panel (c). That forced the central bank to buy even more baht—selling even more foreign currency—until it finally gave up the effort and allowed the baht to become a free-floating currency. By the end of 1997, the baht had lost nearly half its value relative to the dollar. 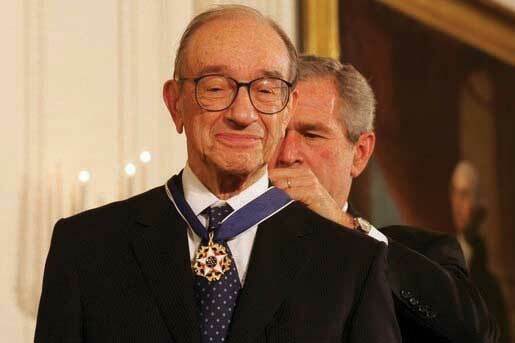 It was the most dramatic development in international finance since the collapse of the Bretton Woods system. 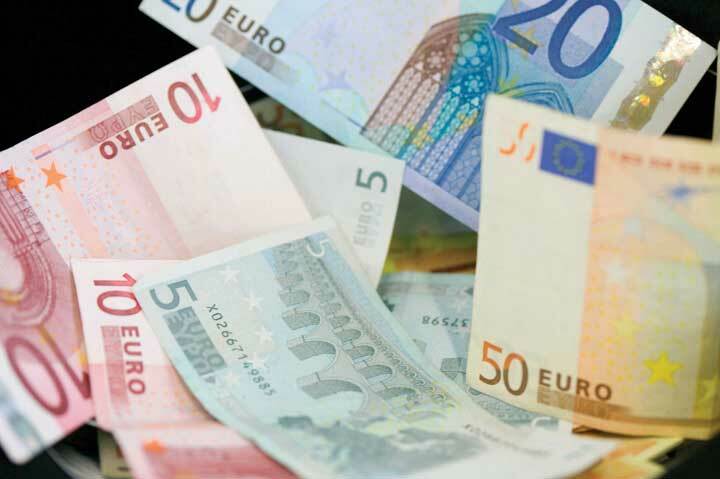 A new currency, the euro, began trading among 11 European nations—Austria, Belgium, Finland, France, Germany, Ireland, Italy, Luxembourg, the Netherlands, Portugal, and Spain—in 1999. During a three-year transition, each nation continued to have its own currency, which traded at a fixed rate with the euro. In 2001, Greece joined, and in 2002, the currencies of the participant nations disappeared altogether and were replaced by the euro. In 2007, Slovenia adopted the euro, as did Cyprus and Malta in 2008, Slovakia in 2009, and Estonia in 2011. Notable exceptions are Britain, Sweden, Switzerland, and Denmark. Still, most of Europe now operates as the ultimate fixed exchange rate regime, a region with a single currency. The participants also agreed in principle to strict limits on their fiscal policies. Their deficits could be no greater than 3% of nominal GDP, and their total national debt could not exceed 60% of nominal GDP. The fact that many of the euro nations had disregarded these limits became a major problem for the new currency when the recession and financial crisis hit in 2008. The biggest “sinner” turned out to be Greece, but there were others, such as Italy, that also had not adhered to the agreement. The fiscal situation of other countries, such as Ireland, went sour as the recession and financial problems deepened. The countries that seemed most at risk of being unable to pay their sovereign (government) debts as they became due came to be known as the PIIGS—Portugal, Ireland, Italy, Greece, and Spain—but there was a period in 2011 when even the interest rate on French bonds was abnormally high. The whole world seemed to be waiting throughout most of 2011 to see if the euro would hold together and, in particular, if Greece would default on its debt. Finally, in early 2012, the situation seemed to calm down. The European Union nations (excluding the United Kingdom and the Czech Republic, which are not part of the eurozone) agreed to a new treaty that again requires fiscal discipline but this time has more enforcement associated with it. The European Union was setting up the European Stability Mechanism: a fund to help out with short-term liquidity problems that nations might encounter. Greece agreed to tough demands to reduce its deficit and then became eligible for a second EU bailout. It also managed to negotiate a debt-restricting deal with its private-sector lenders. The euro has been a mixed blessing for eurozone countries trying to get through this difficult period. For example, guarantees that the Irish government made concerning bank deposits and debt have been better received, because Ireland is part of the euro system. On the other hand, if Ireland had a floating currency, its depreciation might enhance Irish exports, which would help Ireland to get out of its recession. The euro exchange rate has probably benefited German exports, since a German currency would probably trade at a premium over the euro, but it has hurt exports from countries whose single-nation currencies would likely be weaker. Also, even though there is a single currency, each country in the eurozone issues its own debt. The smaller market for each country’s debt, each with different risk premiums, makes them less liquid, especially in difficult financial times. In contrast, the U.S. government is a single issuer of federal debt. Even with general regulation of overall parameters, fiscal policy for the 17 nations is largely a separate matter. Each has its own retirement and unemployment insurance programs, for example. In the United States, if one state is experiencing high unemployment, more federal unemployment insurance benefits will flow to that state. But if unemployment rises in Portugal, for example, its budget deficit will be negatively impacted, and Portugal will have to undertake additional austerity measures to stay within the EU-imposed deficit limit. As of mid-2012, the fate of the euro was again dominating news on a nearly daily basis, and the currency experiment was still not out of the woods. Even with the restructuring and bailouts, would Greece be able to meet its debt obligations? With some EU countries slipping into another recession, would the austerity measures they were taking to meet the EU guidelines be self-defeating by making government budget balances even worse as tax revenues fell with the worsening states of their economies? Were countries taking on the market-orienting reforms that might increase their long-term growth rates and productivity? This last possibility seemed the most likely to help over time, but implementation was certainly not a foregone conclusion.